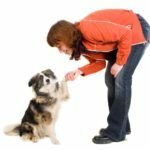 Teaching your dog manners is important, whether you are bringing home a puppy or an adult dog. Rude behaviors that owners often deal with include jumping up, begging at the table and mouthiness. The answer to all of these issues lies in patience, education and positive reinforcement from you. This means no raised voices and absolutely no punishment. 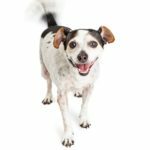 This can be challenging, but punishment leads to conflicted emotions in your pet, worse behavior, and, sometimes, aggression. Having a dog that jumps on people is not only annoying, but it can also hurt and scare people. Most dogs don’t jump up for aggressive reasons. The usual reaction is to push the dog down or talk to him. Dogs think this is great! They jump up to say hello and then we touch them! You are reinforcing the bad behavior. If your dog jumps up on you, ignore him. Turn away with your arms crossed and do not even make eye contact. As a social animal, being ignored is not a dog’s favorite thing. 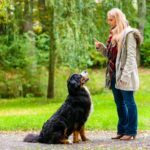 As soon as the dog is sitting calmly, say, “Good dog!” and offer a treat. Carrying treats in your pockets will make this easier for you. Soon your dog will learn that sitting calmly gets a better reaction than jumping. Ignoring your pet is also useful at the dinner table. If your dog is begging, do not speak or look at him. Any food that accidentally falls to the ground will reinforce begging behavior. If you can’t avoid this situation, the dog may have to go to a different area during mealtime. Be careful that this segregation doesn’t seem like punishment. You can offer a toy or treat at mealtimes to keep him busy. Should you wish to offer table scraps to your pets, make sure you do not feed them in the same room as the dinner table. 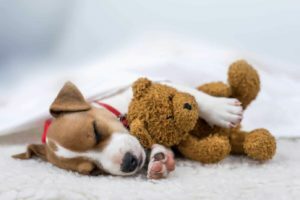 Mouthiness can be a challenging issue, but it is a common one, particularly with puppies. Be cautious with this problem, because puppy mouthiness can easily turn into unacceptable and dangerous behavior if it is reinforced. One rule of thumb is to never play with a dog aggressively with just your hands. When these dogs become excited, they may nip at your hands when you are just petting them. In these situations, you have two options: quietly end the play session or redirect their attention to an appropriate toy. 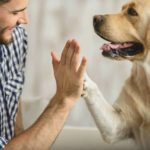 Dogs have a completely different language from people, which can contribute to misunderstandings and accidentally reinforce bad behavior. 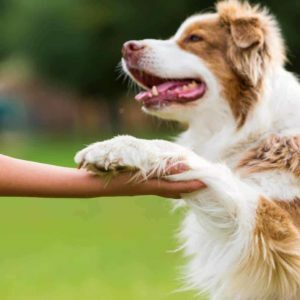 Dogs look to us for social cues. So, for instance, if you’re at the vet, and your dog is whining and staring at you, the best reaction is no eye contact, no words and certainly no touch until they demonstrate calmer behavior. Having a quiet area (such as a mat or a dog bed) where your dog can go to lie down and relax is very helpful. Teach the dog that this is their safe spot, by using tranquility exercises. Bring your dog to the mat and encourage him to lie down. As soon as he lies down, give them a small tasty treat. The goal of these exercises is to teach the dog to relax on the mat in the face of any distraction. Stand in front of your dog (while he’s on the mat) and watch him for a few seconds. Then give him a treat. Take a step back from the mat and give a treat if he stays on the mat. Take a step sideways, and give another treat. Increase to two steps back from the mat, and so on. Don’t do this for any longer than 15 minutes a day, and intersperse the exercises with breaks. and calmly. The mat is not a punishment or time-out area. Catherine Bono is an experienced marketer, who is passionate about dogs. She created the crittersitca.com after an experience with his own dog, Kupo! She learned that doing proper research, and learning from others’ experiences can be just as important as taking a veterinarian’s advice.